It's that time again. Time for King Cake! I look so forward to this time of year. Being up here in the middle of the country, they really don't celebrate Mardi Gras. I saw my first King Cake of the year at the grocery store last night. I squeeled with delight, embaressing my daughter. I was setting it on the counter when something caught my eye. A warning. Here is what I want to know. Who ate the baby? The plastic baby or the beads? Cuz you know someone had to have done it in order for their to be a warning. So go out and buy yourself a King Cake. 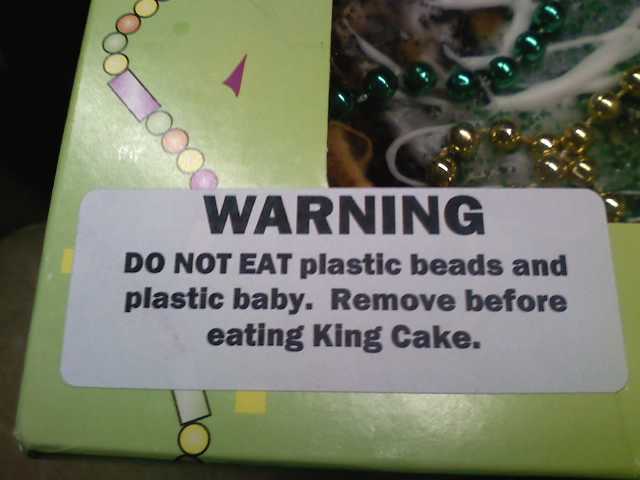 Just be sure to not eat the baby and the beads. Labels: King Cake, Mardi Gras, stupid warnings. Ha! Too funny. Absolutely someone had to have ate it and then called the consumer hotline to ask what they should do! Enjoy your cake. Plus I love any chance I can get to embarrass my daughter in public. that's funny. Enjoy the cake! That is hysterical. Don't eat the baby! Ha! I've never heard of a King Cake? I'm going to have to google this... hmmm... LOL but yea whenever I see a warning that just makes me go "WHA??" I realize SOMEONE did it to make them slap a label on. And Keep up the great blogging!! !